Fredericksburg, Texas, celebrates its German heritage through Oktoberfest. Oompah at its best. German music, food and drink, arts and crafts, children's area and family fun. OKTOBERFEST is a colorful, festive celebration of Fredericksburg, Texas' German heritage. OKTOBERFEST has become an annual tradition around the world. OKTOBERFEST is a community event of family entertainment featuring two stages and two tents with continuous oompah music, art and crafts, Children's fun area ~ Kinder Park, a German Bier Tent, and Oktoberfest Vineyard area, plus delicious food and drink ... all weekend long! 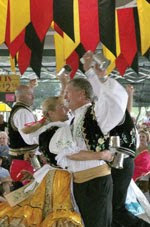 · Three covered stages hosting continuous entertainment with some German favorites -- oompah, polka, and waltzing, with exhibitions, contests, and plenty of opportunities for dancing - including the irresistible "Chicken Dance!" · Super kids area where they can play to their heart's content on the Bungee Jump, Jumping Castle, and other fun games and activities right on the grounds. "Funtabulous," the word Rockbox created especially for you to describe the live-music entertainment experience awaiting you every weekend. Family entertainment from the golden era of rock n roll. Each week a different live-music entertainment experience filled with costumes, comedy and choreography. Show schedule is 8:00PM Friday, 4:30 & 8:00PM Saturday and 1:30PM Sunday. Please call 830/997-ROCK or 866/349-6688 for more information. Tickets are $12.00 and are available at the door or by phone with a credit card. Includes logo wine glass, wine & food tastings. Meet the Winemakers! Autographed bottles available. A time to celebrate Texas wines and fellowship with Texas Tech Hill Country Alumni and friends. This fund-raising event will benefit local scholarship recipients that will attend Texas Tech in Lubbock, Junction or Hill Country University Center. Wine samples: 6 plus bonus wine of the week - receive 10% off cases purchased while at the event. Come join the fun under the Texas stars! Cactus Country has been performing in South Texas and the Hill Country for over 20 years. They perform at many festivals, conventions, private parties, and trail rides, in addition to performing regularly at area dancehalls. They have been featured with many Nashville stars including Rick Trevino, Gary Allan, Tracy Lawrence, Tracy Byrd, Charlie Daniels Band, Chris LeDoux, Clint Black, Johnny Lee, Moe Bandy, Doug Supernaw, and even the Dixie Chicks before they became famous! They have also performed with Tejano stars Roberto Pulido, Emilio Navaira, and Patsy Torres, as well as Grammy award winner David Lee Garza. As always, Pat's Hall, 406 Post Oak Road, will have great dancing music! It's easy to get tickets at www.PatsHall.com, or come by the Pat's Hall office Monday through Friday, 8 a.m. to 4 p.m.
A benefit concert for Hill Country Crime Stoppers. Pat's Hall is at 406 Post Oak Road. The doors open at 7 pm. Tickets are $25 at the door.